The eServices market consists of four categories: Online Food Delivery, Event Tickets, Fitness and Dating Services, which will be discussed in this report. The market will generate a worldwide revenue of US$267 billion by 2023.
eServices is one of the hot topics when it comes to digitalization and disruptive changes to traditional industries. eServices bear a wide range of benefit to its customers. The globally rising number of internet as well as smartphone users also impacts the adoption of eServices and drives growth. 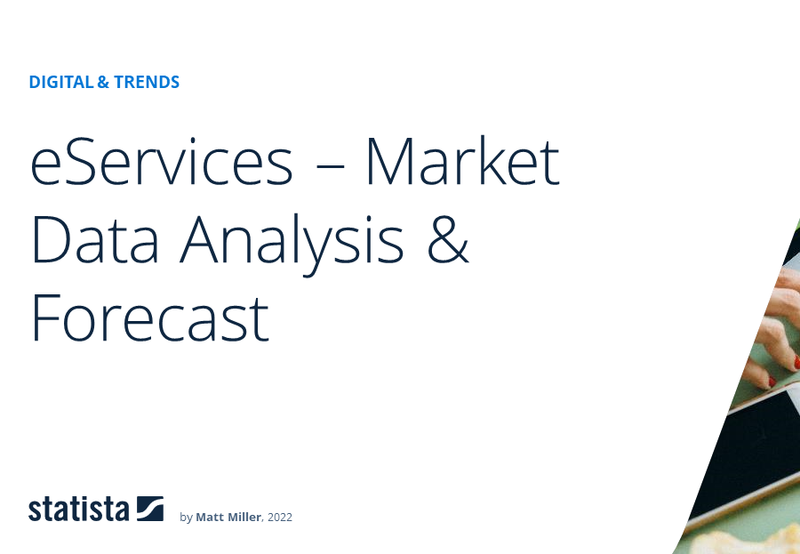 In this report, we consider the three major eServices markets: the U.S., China and Europe. China will be the biggest market in 2023 with a revenue of US$77 billion. The report covers the sale of online services and digital goods via the internet. The definition includes Online Food Delivery (Restaurant-to-Consumer and Platform-to-Consumer delivery), Event Tickets (Sport Events, Music Events and Cinema Tickets), Fitness Apps and Wearables as well as Dating Services (Matchmaking, Online Dating, Casual Dating). The ticket reservation or purchase can be completed on a desktop PC or via mobile devices (Smartphones or Tablets).